The Gülaylar Group was founded in 1926 by İhsan Gülay. But when second-generation Mehmet Gülay took over the helm of the company in 1951, Gülaylar’s first real growth occurred quickly, first on the local, then on the national level, and was soon followed by international expansion; a consistent story of growth that still persists to this day. Today, relying on 80 years of experience and a secure foundation, the Gülaylar Group continues to operate in its main branch, jewelry, offering a wide range of services, from design to production, wholesale to retail, and exportation to importation. In time, by adding other branches to its core jewelry sector such as tourism, real estate and construction, the Group has become one of the pioneer establishments of Turkey making its presence felt in the international arket. The Gülaylar Group, ranked 108th among the 500 leading Industrial corporations of the country, consists of 36 corporations, each of which is the leader of the sector that they operate within. In the jewelry branch, it has conjoined and gathered all its corporations under the Jewelry Group. With the design team within the Research & Development division, we export exclusive collections of products to more than 55 countries throughout the world. Among those countries are: the U.S.A. , Germany, France, England, the Netherlands, Australia, Japan, Italy, Canada, Saudi Arabia, Dubai, etc. 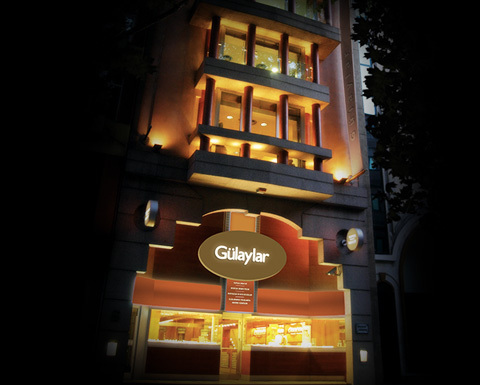 The Gülaylar Jewelry Group, by opening the Elite Gold Inc. in the world’s biggest commercial center, New York, has carried its long tradition of wholesale and exportation of gold and jewelry to the United States. Elite Gold Inc., resident of “Manhattan, 47th Street”, continues to operate as an international corporation since 2000. Diamond Line, one of the brands of the Gülaylar Jewelry Group, offers montur and diamond products. It is a prominent company in the Turkish Jewelry sector with its high quality products that appeal to different tastes and budgets. With the Gülaylar Group’s goal of sector diversification, investments in tourism began in 1982, then moved on to the construction of a 5 star, 500 bedroom capacity “Elegance Hotels International” in 1989 that began its services in 1992 in Marmaris. In the period when the investments were made, the hotel, the 2nd five star one, and built by %100 percent equity capital, was a well known entity. The Gülaylar Group, with its almost 20 years of experience in tourism, receives the royalties of “Elegance Hotels International” for both Europe and the United States. Anticipating tourism to be among the first three crucial business areas of Turkey, the Gülaylar Group is planning to continue investing in 5 star hotels initially in Istanbul, and later in five different metropolises all over the world. Other sectors that the Group is active in are Real Estate and Construction. A member of the Gülaylar Group, “City’s Property Development,” is presiding over the management of real estate assets and construction contracts. It also deals with finding, or building, managing and assessing the accretion value of real estate properties that benefit the Group interests. but also in many countries around the world.